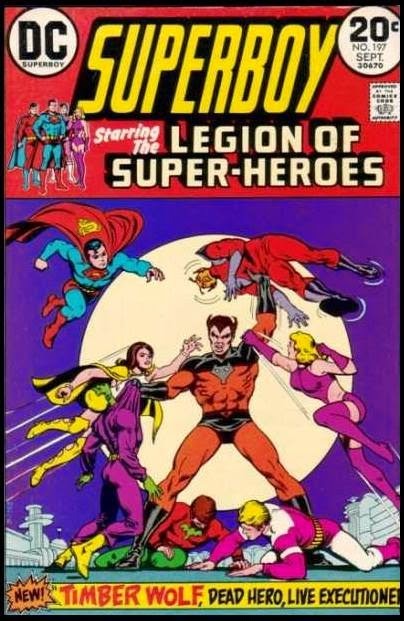 Some recent threads on Facebook have been discussing various members of the Legion of Super-Heroes. In spite of several mishandlings and reboots over the last 20 years, the Legion maintains a large and devoted following--the envy of any writer who hopes to create a franchise or a series of popular characters. Even today, in the absence of an ongoing Legion comic book series, fans still like to discuss their favorite and not-so-favorite characters. I found myself weighing in on some of the discussions, and in doing so, I learned a few things: 1) I still had a lot to say about the Legion, 2) even characters I didn't really care about provoked strong feelings in me and in others, and 3) as a writer, it was interesting to note what resonated with me and what didn't about each character. All images and characters © and TM DC Comics, Inc. Timber Wolf (Brin Londo) was kind of an "also ran" character I could never get a good handle on. My first exposure to him was Superboy # 197 (the cover displayed here), and he was by far the most dynamic looking Legionnaire of that time. The story also showcased him to great effect: he went from being brainwashed into trying to kill the president of earth to preventing Legion HQ from blowing up. After that, he just sort of faded into the background. I was never impressed with his super-agility, not on a team with Superboy, Mon-El, Lightning Lad, Phantom Girl, and other characters with far more interesting powers. Even Bouncing Boy's power was more imaginative. I finally warmed up to Brin when he became the lovable loser in the 1980s: getting dumped by his long-time lover, Light Lass, having a fling with the already married Saturn Girl, and becoming Blok's stooge. Brin tried hard to do the right thing, but he just didn't get "it" (whatever "it" was), something I could relate to. Then, in the Five Years Later period, he mutated into a creature known as "Furball" and I lost all interest and hope for him. 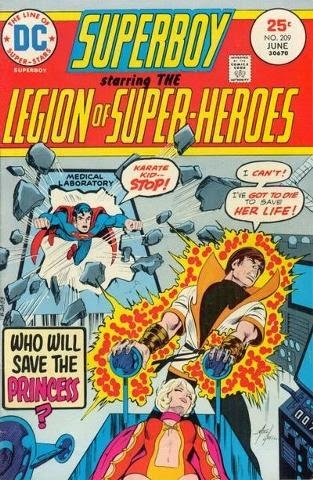 [On Princess Projectra’s tendency to get illnesses that rendered her comatose]: She did seem to get sick a lot during the early Superboy run. But I never disliked her for that reason or any other. Like Timber Wolf, she was an "also ran" character for whom I had no strong feelings for or against. The idea of her being an actual princess was just sort of there and didn't really play a huge role until the Karate Kid series, when we learned that Val (Karate Kid) had gone back to to 20th century to convince King Voxv he was worthy to marry Jeckie. Later, Voxv died, Jeckie inherited the throne, and she and Val married and retired from the Legion . . . a fitting and "happily ever after" ending, or so it should have been. Val's death during the Legion of Super-Villains war was wholly unnecessary (boo, writer/artist Keith Giffen!). Though Jeckie later returned to prominence as Sensor Girl, I would have preferred it if she and Val had remained happily in the background. To me, Thunder (CeCe Beck) is one of those "why not?" characters. Why not have a member of the Captain Marvel family join the Legion? Why not have someone from the future (the Legion's future, that is) come back in time and join the team? In this way, Thunder was sort of a reverse Superboy, who came from the past to join the Legion. Power wise, Blok didn't seem to contribute much (super density? That's a power?) unless somebody fired energy beams at him. Mainly he was used just for super-strength. Personality wise, though, he added a lot to the team. He was the innocent outsider who reacted with curiosity to the Legion (and, therefore, enabled new readers to discover the team as he discovered it). He played straight man to Timber Wolf, providing comedy relief, and his relationship with the White Witch was touching: a platonic friendship that transcended boundaries such as race and physical attributes. 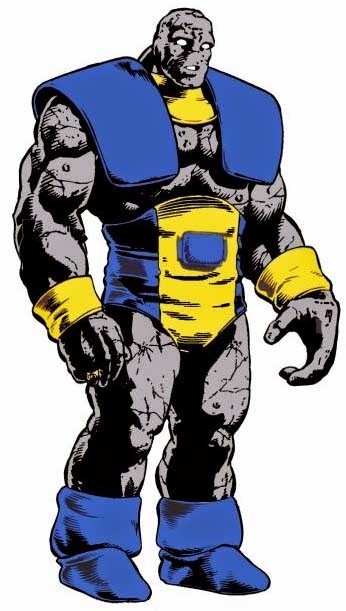 In some ways, Blok in the '80s personified what the Legion was all about: an apparently useless power that still found worth, a positive and curious outlook on the future, and the ability to look beyond physical limitations to find value in others.